fleet street fox: Hooligan (n.): A rough, lawless person. THE world was a different place 23 years ago. It was a world where men kicking a ball around a pitch was not so much a family day out as an excuse for violence and thuggery. The police did pretty much as they pleased and journalists were not much different. Or at least that was how it seemed to everyone else - in truth most of the football fans, coppers and hacks were decent people who did their best but were tainted by association with a handful of idiots. It was easier to cross the road, pretend not to notice them, and keep your head down. And who can blame them? One dad out to watch the match with his boy is never going to be able to stop a horde of drunken yobs hurling concrete blocks at riot police. It is not a practical fight to pick. So they got away with things they wouldn't today. There weren't cameras everywhere, it was difficult to know what other people were thinking, and there weren't a lot of rules. So when 39 football fans were killed and 600 were injured when two rival groups of hooligans clashed at the Liverpool vs Juventus match at Heysel Stadium in 1985, it was easy to think that everyone involved was a murderous thug. In fact most of the dead were innocent, and in trying to escape the fighting knocked over a badly-built wall and crushed the fans sitting behind it. In those days there were no cameras to pick out the ringleaders so 14 Liverpool ticket holders were jailed for involuntary manslaughter, and their club was barred from European matches for six years. Every other English club was barred for five. The newspapers which have always sold millions of copies on the basis of their sports coverage blamed the 'hooligan element', and people like me grew up thinking football was about violence. A couple of decades on we can all see hooliganism across Europe had a lot to do with Far Right agitators, and still does. And that because the 1980s saw the value of football transfers rocket as players became media stars, money that should have gone into maintaining and modernising Victorian grounds went into the pockets of players and agents. Four years after Heysel it seemed to happen again - only this time it became the worst disaster football, the police or the newspapers had ever seen. Liverpool fans - people then reviled by almost everyone in Britain for that European ban - delayed by unexpected roadworks turned up late at a FA Cup semi-final at the Hillsborough Stadium to watch their side play Nottingham Forest. After all the violence of the past, the stands were now separated into vast wire cages. The man in charge of the police operation, Chief Superintendent David Duckenfield, expected only trouble. He decided that although there were more of them them the Liverpool fans should go into the smaller end of the stadium, to avoid having to cross the path of Notts Forest fans. There were too few turnstiles and a crush developed, made worse when they decided not to delay kick-off even though thousands of people were late and still outside. As the crush got worse Duckenfield ordered a side gate to be opened to relieve the pressure. Fans poured in, but there were no stewards to direct them into the empty areas. Instead they followed stadium signs pointing them into cages that were already packed. Each cage should have held only 1,600 people - they ended up with more than 3,000 packed in. As the people at the front began to climb over the fences to get out, TV commentators called it a pitch invasion. When fans began pulling down hoardings they were called hooligans in homes up and down the country, where millions watched it live on Grandstand. Duckenfield, in his control room, decided it was thuggery. He sent a line of police officers onto the pitch to prevent fans getting to the Notts Forest end. The referee called off the match six minutes after it began. But as time ticked past it became clear there was more to it. The hoardings were being used as makeshift stretchers, people were being hoisted up and out of the crush by those who'd scaled the wire, and some who could not get out tore holes in the cage with their bare hands. Sports photographers caught every second of it on film. Grandstand kept on broadcasting. The country sat on its sofa, aghast. Forty four ambulances were called but only one allowed into the stadium. Those makeshift stretchers were turned back at the police line as they tried to get to the paramedics. Many of the dead were children - the youngest was 10. Ninety four were killed that day, in their cage and left to die on the pitch. Two more severely-injured died later. Still others have since reported suicides, post-traumatic stress, alcoholism and other problems. The first newspaper reports were done in a rush, for the Sunday editions. Most of the photographs, even by the gung-ho standards of the time, were too gruesome to use. Relatives were identifying the dead from Polaroids. No-one had a clear idea of what happened. 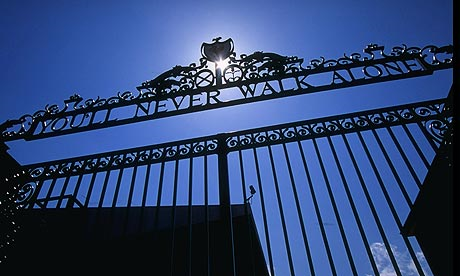 Duckenfield was said to have told officials fans without tickets had forced open the side gate. 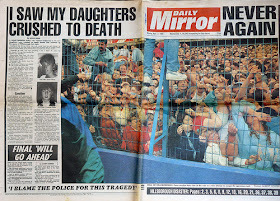 On Monday the Mirror printed photographs of fans dead in the crush under the headline 'Never Again', and as one of the first newspapers to use colour the true horror of blue faces and bloodied bodies caused huge shock. There were angry radio phone-ins, and the paper's legendary editor Richard Stott spoke publicly about his decision and why he thought it was important to get across the true scale of what happened. 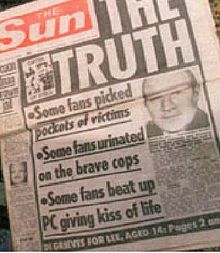 On Tuesday the Sun said the police were being made 'scapegoats' for a disaster caused by ticketless hooligans, and on Wednesday it reported claims by Tory MP Irvine Patnick and an unnamed police source that in the crush Liverpool fans picked the pockets of the dead, urinated on police and attacked rescue workers. The reporter who pulled the story together told the editor Kelvin MacKenzie he was worried about it and stressed they were allegations, not facts. The 18 or so staff sent to cover the disaster and more aware of who to trust and what went wrong were in Liverpool, not the newsroom. The editor laid out a front page with the headline 'The Truth', and in the pub his hacks sat around shaking their heads and predicting trouble. When the paper hit the streets it was greeted with fury, but MacKenzie refused to give interviews or explain why he'd done the story. Rage grew, copies of his newspaper were burned in the streets, and it became the greatest Fleet Street disaster of all time. The Sheffield Star, Daily Star, and Liverpool Post wrote similar stories - but they weren't noticed. There has never been any proof for the allegations. Shortly afterwards an official inquiry found the police were largely to blame, with the stadium's age and layout contributing to problems along with a 'small minority' of drunken fans. The coroner refused to consider anything that happened more than 15 minutes after kick-off, despite evidence many of the victims were still alive. Duckenfield retired on medical grounds before he could be disciplined. In 2000 he faced a private prosecution but the jury failed to reach a verdict. He admitted lying about the cause of the disaster and several other officers were accused of leading a cover-up, tampering with evidence and statements. Among them was Norman Bettison, who later became the local chief constable. And for 23 years, mums and dads, sisters, brothers, grandparents, sons and daughters, were told to stop wallowing in self-pity. 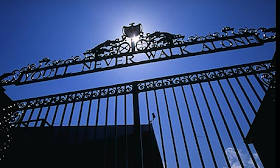 The relatives of the 96 said there had been a cover-up, that the police were telling lies, and their antipathy towards the country's biggest-selling newspaper was blamed on the fact it had recently laid off workers in Liverpool. The dead were dismissed as hooligans who got what they deserved. Today we have learned all the victims - even children - had their blood tested for alcohol. The police searched their criminal records to see if their characters could be impugned after death. They significantly altered 164 official statements to change the record of events, and removed 116 comments blaming them for the disaster. We have had it confirmed the ground was poorly maintained and inadequate. There had been a crush at a match the year before and nothing had been changed to prevent a repeat. There were medics who could help the injured, but did not. There were 41 people who perhaps did not need to die, but did. Following the disaster, football stadiums were given health and safety rules and clubs were forced to spend money on safety. Shortly afterwards all the editors in Fleet Street signed up to a code of practice, which when followed keeps us out of trouble. The police have rules, too, about crowd control, public safety, and evidence. Perhaps more important than any of those things we all have a camera in our pockets, and can tell the world what we're thinking in a few seconds. Not only could Hillsborough not happen again, the lies told after could not take hold. David Duckenfield retired on a full pension. Norman Bettison was knighted, as was Irvine Patnick. MacKenzie was ordered to apologise but later recanted. Barely any shop on Merseyside will stock the paper he left 18 years ago, and Sun reporters still hate that story as much as they did on the day it was printed. None of them ever really said sorry, but then hooligans don't. The world is a different place today, which is why I can write that hooligans were the cause of the Hillsborough disaster. Hooligans in the police force who made it worse, hooligans in the football business who saw no reason to spend money on safety barriers, proper signs or exits. Hooligans who lied and smeared to cover up the fact people had died unnecessarily, the hooligan who was running the nation's biggest newspaper, and the hooligans running the country who saw no reason to reveal the truth any sooner. They are the hoodlums who took a football match and turned it into 23 years of torment. No-one stood up to them, because it was an impractical fight to pick. No-one except the families of the 96. It would have been easier for them to keep their heads down. Sorry is no kind of justice, but perhaps saying 'thank you' is because the world is slightly better for their stand. It's just a shame the real hooligans aren't in cages.